Add Pom Pom Soup to the TOP of your to-do list. ASAP. Oh my goodness. Pom pom soup was a hit among hits. But first the most important information: my pom pom balls are FINE. Dry and fine, and I’ll show you how. RELATED: Curious what learning looks like at my house? 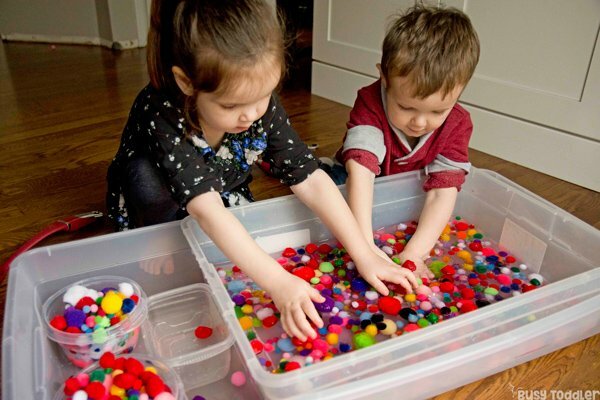 Check out “Playing Preschool” – my activities program. You read that right. 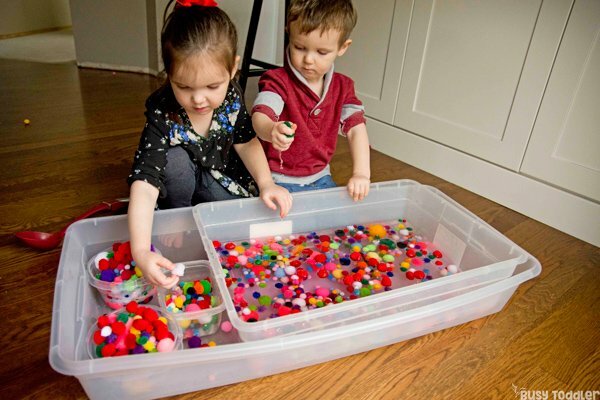 Pom pom balls can get wet and live to tell about it! 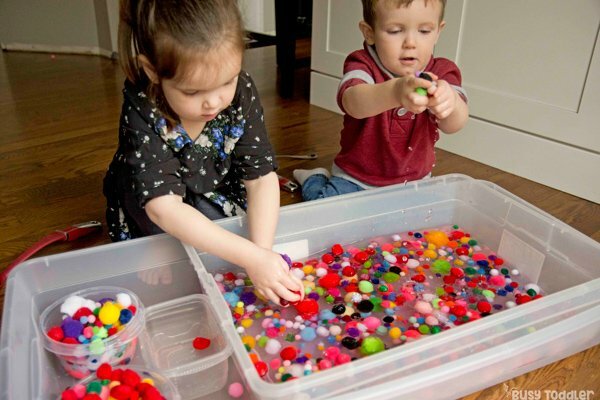 The Paige Diaries and their“Pom Pom Ice-Cubes”, and Happy Toddler Play Time and their “Pom Pom Water Sensory Bin” . But how do you save them from the wet? We will get to that – it can be done, it’s super easy, but first… LET’S MAKE SOME SOUP! I went with a double binning option for this watery activity. I set my larger bin on the floor and carefully put the smaller bin inside. It’s not a perfect fit, but good enough. 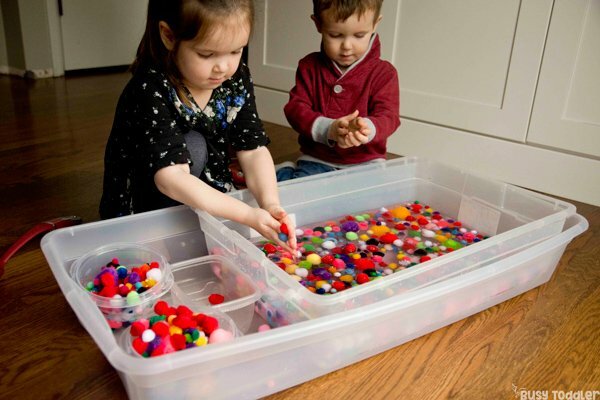 In that smaller bin, I dumped my pom pom balls (I’ve had these for years) and filled it with water. We were in it now! 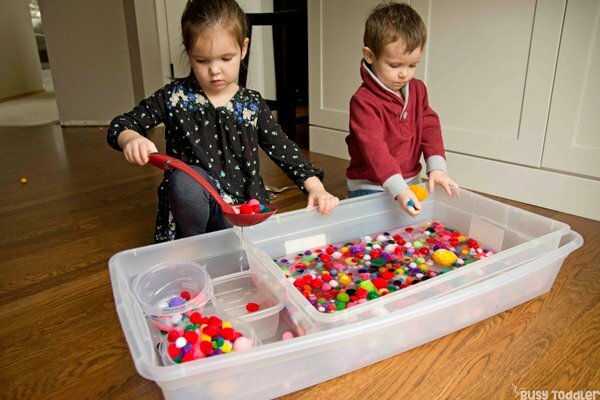 RELATED: Looking for more quick and easy toddler activities? Check out this list. Well, at first – they freaked out. 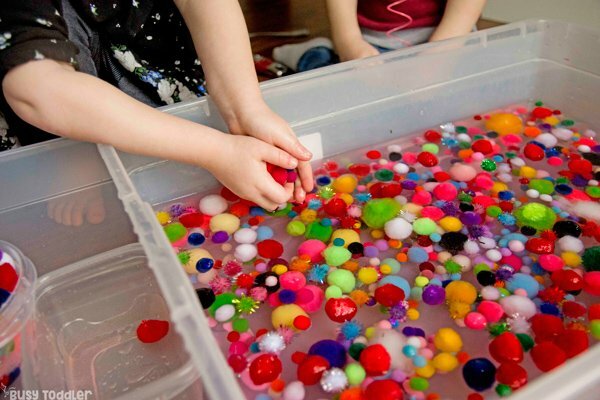 “MOM PUT POM POMS IN WATER!!!! !” is what my 4 year old shouted. My 27 month old was just excited for anything water related. The pom poms were a bonus for him. They scooped, they smooshed, they transferred, they imagined – and they had a grand old sensory time for 40 something minutes. It was one of the most fun activities we’ve ever done. But how in the world did we save the pom poms? 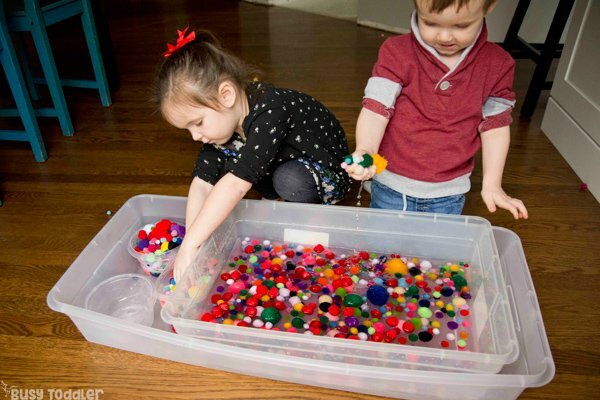 We started by transferring all the pom poms to a colander and pushed out the extra water. Next, we moved the pom poms to a pillow case and knotted the top GOOD. I started by just throwing them in the dryer but they came out stinky, so I put the whole pillow case in the wash (gentle cycle) and then into the dryer (normal heat). 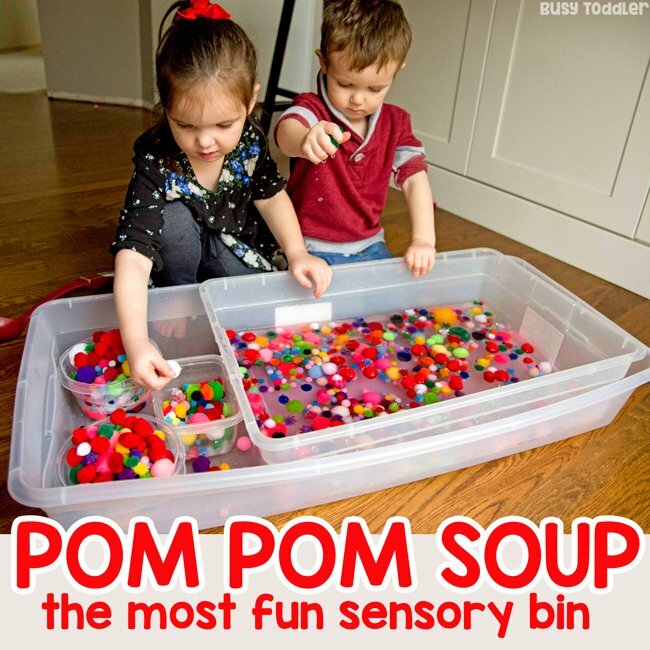 Pom pom soup was the best! 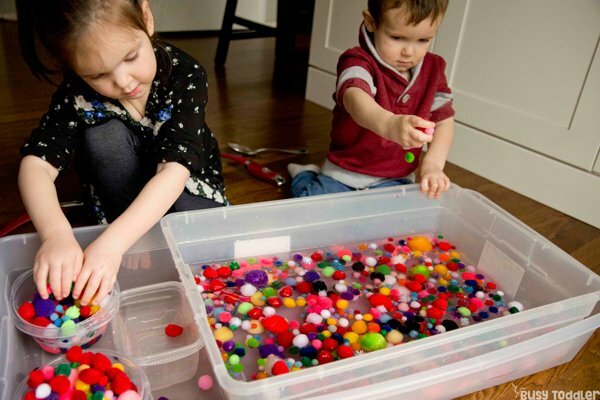 My kids had a blast playing with this and I had a blast seeing my years-old pom poms finally get washed. How’s that for a win-win situation? 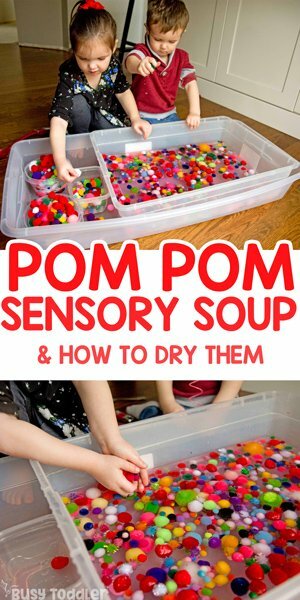 This pom pom soup sensory bin was really perfect and absolutely the best way to make it to nap time. When will you make pom pom soup?